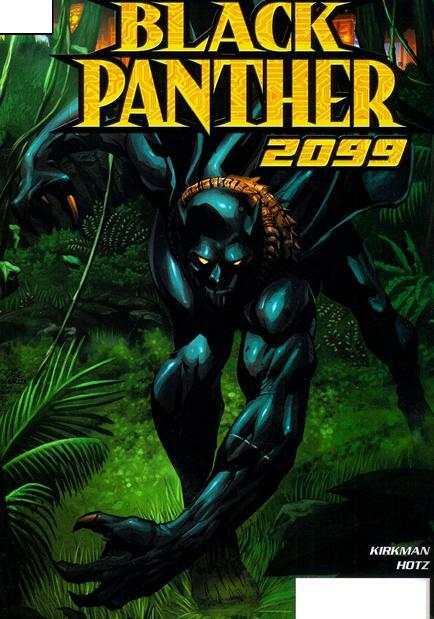 I remember being asked to pitch for a mooted BLACK PANTHER 2099 book at Marvel. The book actually never happened at all. I imagine none of the pitches were up to snuff, and they just killed the idea. I dimly remember mine being a sort of terrifying “Fear Of A Black Planet”/Huey P. Newton thing, with Black Panther Cells run from Marvel’s fictional African country Wakanda destabilising corporate-run America. I think I used some of the stuff in there for my later DOOM 2099 sequence. I wasn’t happy at doing the foot race: I got paid, and my foot hadn’t been in the door that long, and I supposed this was just the way things were done. But I had a feeling that maybe it wasn’t the best way to do things. The difference being that Warren Ellis BP 2009 pitch sounds like it would have been an AWESOME ongoing series, as opposed to the incredibly mediocre and pointless one-shot that Robert Kirkman wrote.